As we were driving down to OKC on Christmas Day, the kids were watching Camp Rock in the back. As you can tell from the video, Jada was having a good time! The best moments actually occurred before I thought to pull out my phone and record it. I came across this Monty Python sketch yesterday while perusing the Mandolin Cafe discussion boards. It’s especially timely with all of the barren store shelves this time of year. Andrea bought this by accident yesterday. 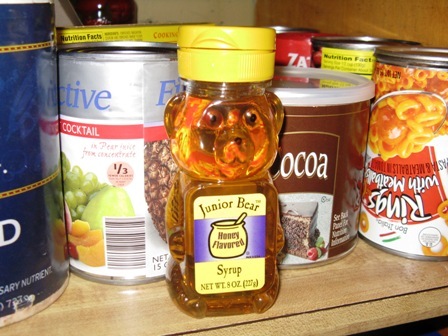 Honey-flavored syrup? What is the world coming to? FYI – this was the Mother Goose & Grimm comic in Sunday’s paper. Yesterday, I went in for an esophagogastroduodenoscopy (EGD). Such a fun word. Basically it consists of sticking a camera down your throat, so the doctor can inspect your esophagus and stomach. Thankfully, they knock you out for it. As the nurse was walking me out to the van afterwards, she asked me if I get extra shots in my Caramel Macchiato. I thought, “Wow! That’s a random question.” So of course, I asked her why she asked. Apparently, the first thing that I asked for while waking up after the test was a Caramel Macchiato. I should be in a Starbucks commercial. Like Jarod, or something. But I’ve been thinking about this whole sedation thing… especially after this morning’s post on character. What else did I say that I don’t remember? I bet people say some crazy things. Probably some really inappropriate things. Maybe that’s a good test of character. Anyway, it turns out that I have an ulcer. I’m guessing it was caused by H. Pylori bacteria, since I tested positive for it several weeks ago. 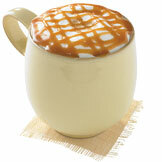 I’m guessing the Caramel Macchiato wouldn’t be very helpful right now, but it sure sounds good.